On June 22nd the Nazi forces invaded the Soviet Union without declaration of war. The Second World War, which raged in Europe, became the Great Patriotic War on the Soviet territory. For a long four years the Soviet people defended their country’s independence and territorial integrity. Numerical superiority in manpower and military hardware secured the Nazis a quick advance deep into this country. But the Nazi blitzkrieg ran into unprecedented heroism and tenacity of the Red Army and in the winter of 1941 the Nazis suffered a crushing defeat near Moscow and were thrown off 200 kilometers. Following the fiasco the Nazi command gave up on advancing throughout the entire front and chose to carry out the summer campaign of 1942 on the southern direction alone. Hitler wanted the wheat, coal and oil-rich areas of the Don, Volga and Caucasian Regions to paralyze the Soviet economy. Stalingrad and the Caucasus were picked for a major blow. The capture of Stalingrad, one of the country’s major industrial centers, would have enabled the Nazis to establish control of the Volga and, provided the developments turned nicely for Germany, would have made it possible for the Nazis to advance northward and thereby cut Central Russia off the Ural rear and then surround and seize Moscow. In the direction of Stalingrad the Nazi command concentrated a mighty force, which outnumbered the Red Army in manpower and hardware. The advance on Stalingrad began on July 17th 1942. Hitler wanted Stalingrad at all costs and the Nazi troops launched attack after attack. The enemy fought for each street or house day and night. The Soviet troops, pressed against the Volga bank, fully aware that the outcome of the battle is crucial for their country’s future, showed remarkable heroism. “It was as if by a magic wand that more and more personnel and hardware grew out of the vast steppes of Russia, as if a skillful magician was moulding the Ural clay into Bolshevik men and vehicles in profusion.” At dawn on November 19th 1942 Soviet troops struck with fire at the enemy from the south and north and four days later encircled the 6th army of General von Paulus. It was the first major battle of the Nazi forces since the beginning of the Great Patriotic War. Germany was shocked. Hitler ordered Paulus to hold out to the last soldier. He knew that losing Stalingrad would mean losing the initiative for good and leaving the Volga, an area in the very heart of Russia. To help the besieged 6th army Hitler sends the “Don” group commanded by Field-Marshal Manstein. After breaking through the Soviet defenses the Nazis reached the Myshkov River, the last natural stronghold on the way to Stalingrad, which was only 40 kilometers away. The future of Paulus’s army was at stake, so fighting was particularly fierce in the area. The Soviet defending force was dwindling rapidly. On December 24th it was joined by the 2nd Guards Army of General Malinovsky and threw Manstein back from Stalingrad. From that moment on the 330-thousand strong Nazi group was a besieged POW camp. In the Soviet headquarters von Paulus asked one of the generals to explain why the Soviet soldiers were fit to advance day and night and lie in the snow at temperatures as low as 35 to 40 degrees below zero. In response the General pointed at a soldier standing nearby: “Look at what he is wearing.” The soldier had on felt boots, wadded pants, thermal underwear, a short fur coat, a winter hat and mittens. ‘Our Motherland looks after its defenders,’ the General added. Meanwhile, streams of captured Nazis trudged along the roads leading to Stalingrad. Frostbitten, muffled in rags, sacks and felt fabrics, the defeated soldiers and officers looked an abominable sight. The 6th Nazi army ceased to exist. The Battle of Stalingrad lasted for 200 days and nights and left huge losses on both sides: 1.5 million from the Nazis and 1.13 million from the Soviets. The Battle changed the course of the war on the Soviet-Nazi front in favour of the Soviet Union and reversed the tide of the Second World War on the whole. The defeat of the Nazis came as a symbolic grave cross that now loomed over the halo of the invincibility of Nazi Germany. The defeat under Stalingrad shattered the morale of Nazi Germany and triggered widespread resentment over the futile war in satellite countries. The military and political consequences of Soviet successes in the winter of 1942-43 were so impressive that Hitler had to admit on February 1st 1943 that winning the war in the East by acting on the offensive was no longer possible. That, the fuehrer said, had to be accepted as a fact. But even though facts indicated imminent defeat Hitler and his entourage continued to believe that the war could yet be won and there was a chance to reverse the situation. In an attempt to take revenge the Wehrmacht launched preparations for the summer campaign. Victory had to be obtained at any price to save the political image of Germany. Overall mobilization was declared throughout the country and tanks, self-propelled guns and planes were produced at increased pace. In the absence of second front in the West, Germany concentrated the bulk of its forces on the Soviet-Nazi front. In the summer campaign the Wehrmacht planned to destroy the Soviet forces near Kursk, Oryol and Belgorod. And this choice was fully justified. In the course of Soviet advances in the winter of 1942-43 there formed an extensive bulge near Kursk, which was described by war historians as the Kursk Bulge. The bulge put the Soviet troops defending it at risk of being surrounded by the enemy. The Nazi command resolved to take advantage of the situation. To this end, it mounted an offensive code-named “Citadel”, under which the Soviet forces were to be surrounded from the flanks and destroyed west of Kursk. For the “Citadel” operation the enemy brought in 70 divisions, 16 of them tank and motorized, extensively backed from the air. In answer to the Wehrmacht’s plan the Soviet command decided to abstain from a pre-emptive attack but tire the Nazis out in defense, knock out its tanks, and then with fresh reserves launch an offensive and smash the enemy. The Battle of Kursk Bulge started on July 5th 1943. It took the Nazis the first few battles to feel the strength of the Soviet defenses. In the large-scale campaign in which four million soldiers took part and which lasted seven weeks the crucial time fell on July 12th, the day of the biggest in history tank battle, which occurred near Prokhorovka village in the Belgorod Region. Armoured Forces Marshal Pavel Rotmistrov, who commanded one of the tank armies, recalled. Hitler’s command pinned most of their hopes on the new “Tiger” and “Panther” tanks and the “Ferdinand” self-propelled gun. However, the Soviet tanks, which boasted a higher degree of maneuverability, knocked out the armoured Nazi monsters with utmost efficiency. The battle ended with a total defeat of the Nazi tank force, which was turned into a scrap of metal. After the Battle of Prokhorovka the Soviet troops went on the offensive and liberated Oryol and Belgorod. The defeat of the Nazis near Kursk left Germany unable to recover from the losses. The German historian Goertliz wrote that the Battle of Kursk marked the beginning of a deadly crisis in the Nazi army. On the occasion of the victory on the Kursk Bulge on August 5th 1943 Moscow for the first time saluted to Soviet troops. And that was quite justified, for winning the Battle of Kursk meant winning the war. The victory in the Battle of Kursk had far-reaching consequences – it brought forth the collapse of the Nazi bloc, which included a number of European countries, and led to the expansion of anti-fascist and national liberation movement in Europe. 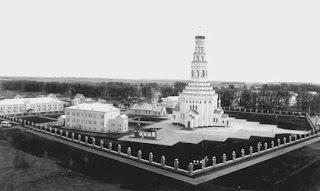 The former battlefield near Prokhorovka is now a park with St.Peter and Paul’s Church and a memorial bell-tower that peals every 25 minutes in honour of Russian valiance in the three major battles in the history of Russia – the Battle of Kulikovo, the Battle of Borodino and the Battle of Prokhorovka. This war is all but forgotten in America. It is strange, but most of the wars that we have taken part in have been forgotten. I suppose because almost none have occured within our own borders, there is little celebration of victory and the days set aside to honor those who died in them tend to be days when stores run special sales that they advertise weeks in advance. An unusual way to honor your nation's war dead. When I was a child that was not the case. On these days, every business closed down, and every family would go to the graves of some member of the family who died in those wars. I used to sit and talk to very old men who would gather in the parks by the war memorials who had fought in the previous war, World War I, and listen to them tell stories about their time on the front and in the trenches. I wasnt so much interested in the war itself but in the individual stories these old fellows would tell. I doubt there are many people still alive who fought in the first world war, and those who fought in the second are rapidly going as well. I simply find the differences in the way our two countries give memory to the second great war interesting. I think that the difference in mentuality between russians and americans also plays a big role. Geographically America's land defended by the waters of two big oceans. Historically a lot of invaders on their way to West or to East needed to cross our territory or planed to occupy it. We need to be ready to defend ourselves we could find allies only for some time. So we could count only on ourselves. Yes, it was difficult for Americans to understand the entire idea of the Eastern Bloc and the spheres of influence that came in the negotiations that ended World War II, primarily because Americans never learned how often Russia was invaded from the nations to the West of it, by the Teutonic Knights, Lithuania (as it was in the late middle ages, a very significant power), from Poland, from Prussia, and later by Sweden. Even from France, when Napoleon was bent on a world, or at least continental empire. While during the Cold War, Americans asserted that the Soviets sought to dominate the world, the Soviet Union rarely attempted to extend itsele beyond the borders that were agreed on at the end of World War II. One of the reasons that in South Africa, many of the anti apartheid groups looked to the Soviet Union for aid in their struggles against the Afrikaaner government, was that they said that at least the Soviets will leave if you ask them to, or if you have to pressure them to leave, they will as well. Steven Biko is reported to have said this in one of his interviews back in the 1970's. He said that America and Europeans, once they got into a nation or region were far less inclined to leave it when asked.